PURPOSE is the aim or goal of a person : what a person is trying to do, become, etc. My husband, David, met someone who used to attend church and understood the meaning of Salvation through Jesus Christ, but he was throwing his life away with drugs and alcohol. He was super depressed because he knew he was addicted and was tired of the life he was living. 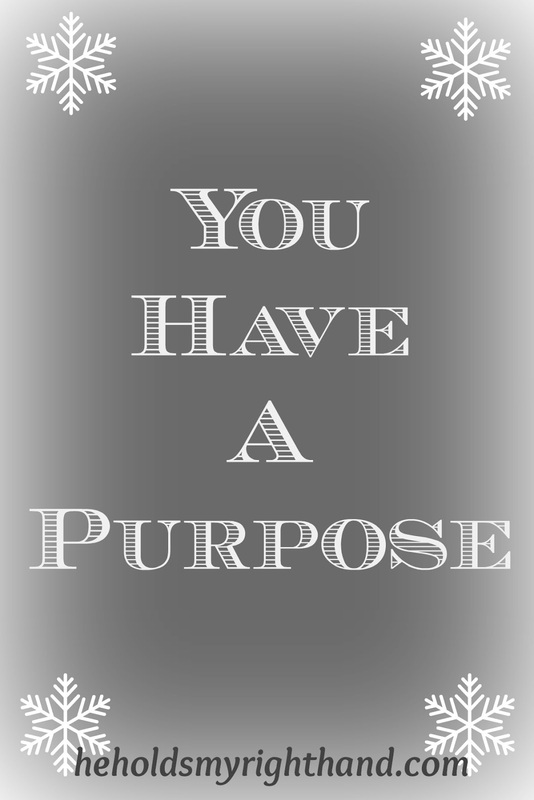 In a brief moment, David tried to encourage the man by simply saying, "God has a purpose for your life." The man focused on David and asked, "Do you really think so?" David answered "Yes" and the man broke down in tears. He felt worthless, and defeated, and stuck; yet someone told him God has a purpose for his life. God had a reason for him to be alive. It was what he needed to hear. It's what we all need to hear from time to time, because we are all sinful and we all have moments when we feel like failures. The good news is that, whatever our failures are, we can always make a new beginning with God. 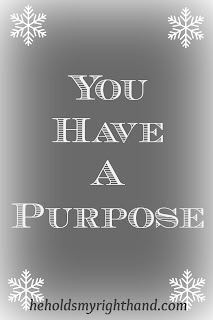 So, remember this: no matter who you are, or what you have been through, our Father in Heaven has a purpose for YOU. Read the following verses to see what God's Word has to say about your purpose in this world. Then, make a new start today, a new commitment, to try and fulfill the purpose God has for you. Mark 16:15 - And He said to them, “Go into all the world and preach the gospel to all creation." Ephesians 5:1-2 - Therefore be imitators of God, as beloved children. And walk in love, as Christ loved us and gave himself up for us, a fragrant offering and sacrifice to God. Psalm 95:6-7 - Come, let us worship and bow down, Let us kneel before the Lord our Maker. to fulfill your God-given purpose.